We woke up to beautiful weather this past Sunday, which was a nice surprise because rain had been forecast for the whole weekend. 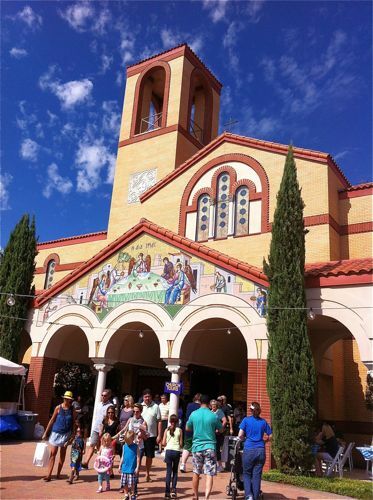 We decided to take advantage of the slightly cooler temps and gorgeous day and headed down to Dallas to check out the Greek Food Festival. It’s been something that I’ve wanted to attend for a couple of years, but we had just never managed to make it until this year. There were two parking lots where you could pay to park and several people had just parked alongside the nearby streets. I had seen someone online mention something about free parking at a park on Valley View Lane, so we found a spot there and walked the half a mile back to the Festival grounds. 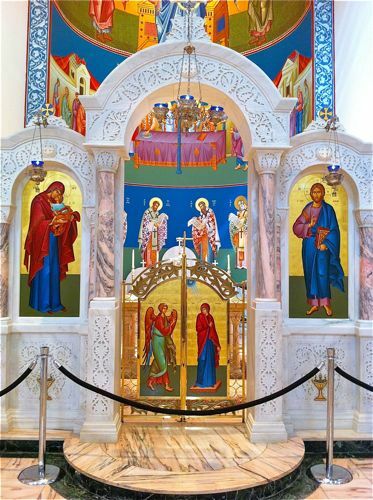 The first thing I noticed was the beautiful church just inside the entrance. Okay, so this may have actually been the first thing I noticed. 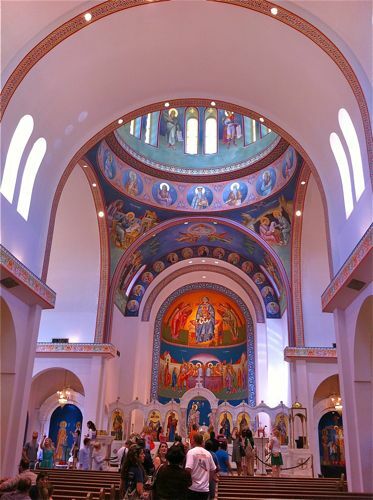 Just kidding, it really was the church. We were each handed a guide book when we entered the gates. It had a detailed list of food prices, recipes, information about the marketplace and church inside it. 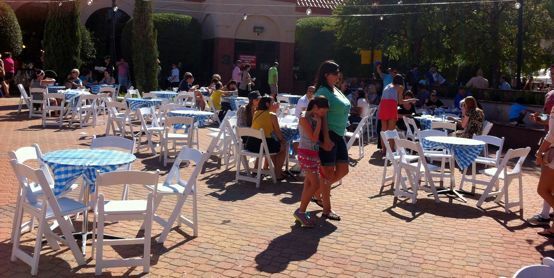 In order to purchase items at the food tents, you first need to buy food coupons. One dollar equals one coupon. The number of coupons that is required to purchase each item is clearly marked at each tent. I had smelled the gyro before we even got inside the festival, so we made a beeline for the coupon tent, purchased $20 worth of coupons and headed over to the Gyro food tent. 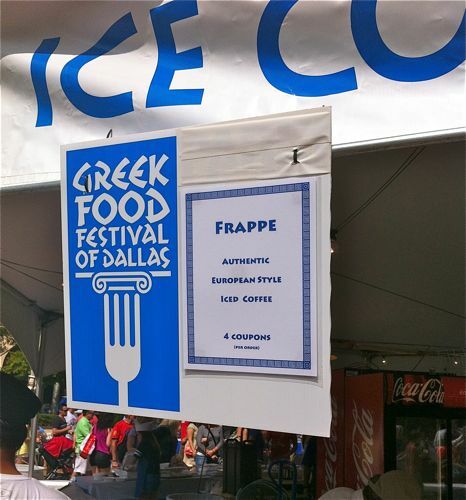 After purchasing the Gyro, we stopped for a couple of iced frappes at another tent. We found a table inside the big dining area and sat down to dig in. 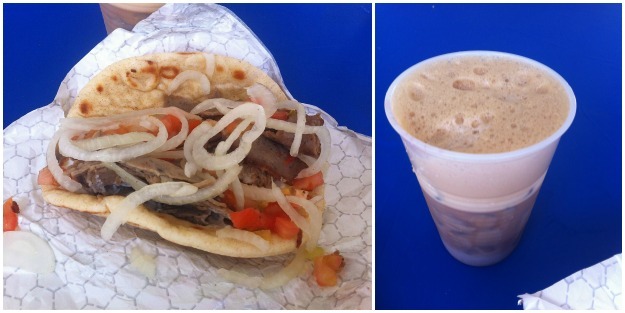 This was my first time trying a Gyro, and it was delicious! We had actually eaten lunch at home prior to deciding to head to the festival, so we decided to share one, but after taking a bite, I was kind of wishing that we had gotten two! 🙂 It was that good. The iced frappe was also tasty. After we ate, we headed into the Agora (Greek for meeting place) to see what the vendors had to sell. We then headed back outside so that we could try a couple of their pastries. 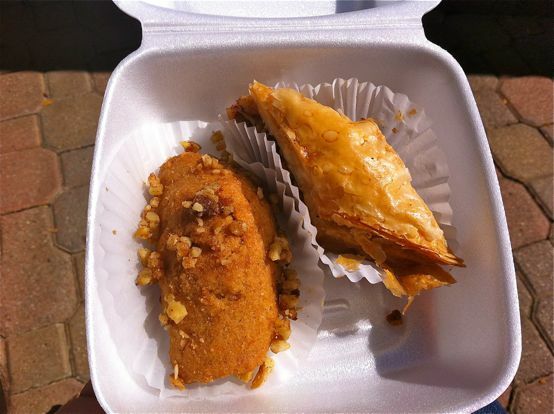 You can’t go to a Greek Food Festival and not try some Baklava, so we got one of those, and we also picked out a cookie called Fenekia (a honey-dipped cookie sprinkled with walnuts). The phyllo of the Baklava was nice and crispy, and it was very sweet, just like I expected. The Fenekia was less sweet, and I think it would have been good dipped in a cup of hot coffee. After we wiped the honey off of our hands (Baklava is messy! 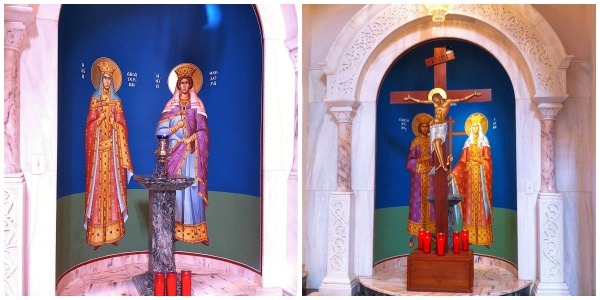 ), we headed into the Holy Trinity Greek Orthodox Church to look around. 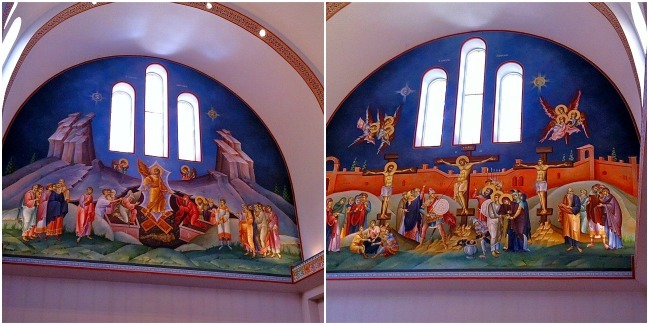 These pictures don’t do the painted murals justice. I honestly didn’t edit this next photo much at all. 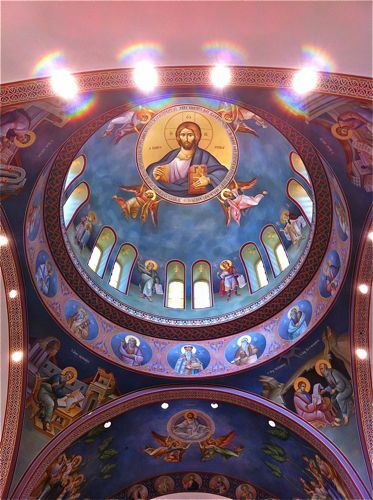 The natural light coming in from the windows above made the colors so vibrant! 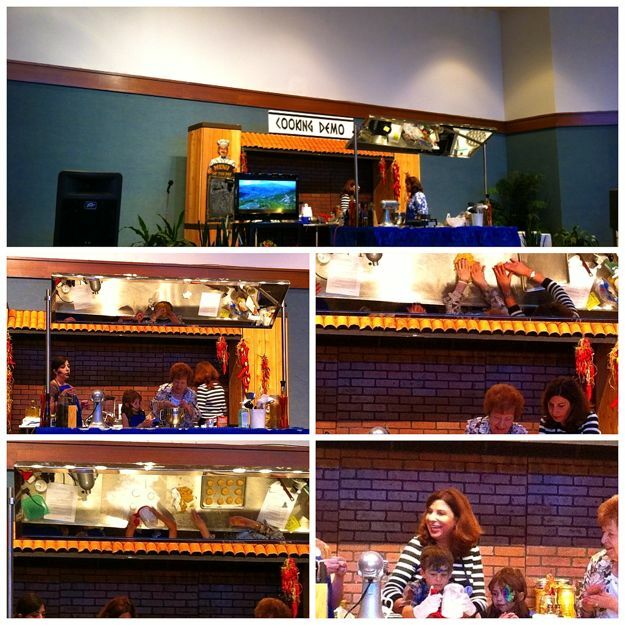 There were three cooking demonstrations on Sunday, but the first two were already over by the time we got there and had eaten. We caught the last one, which was a Kourambiethes (soft butter cookies, with powdered sugar topping) demo. 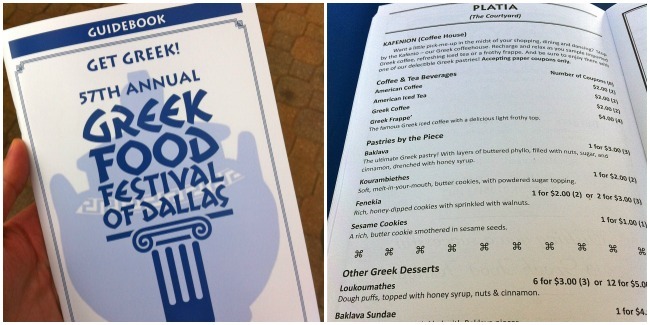 It was a fun afternoon, and I’m so glad that we finally made it to the Greek Food Festival of Dallas this year! 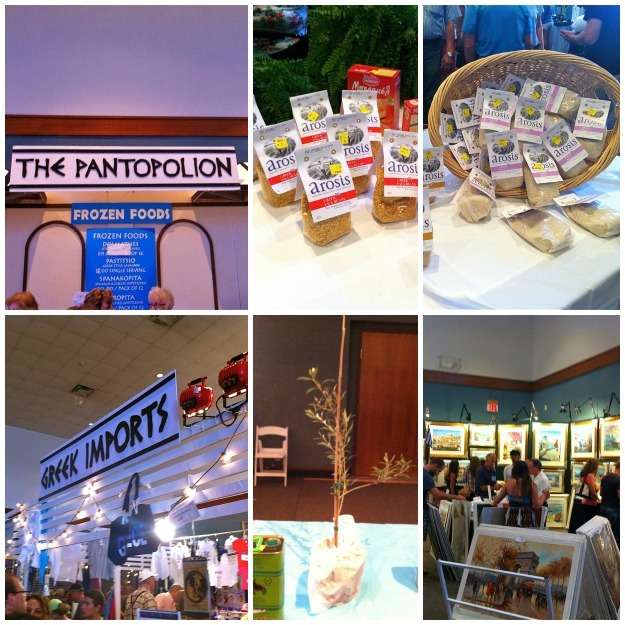 Have you ever been to a Greek Food Festival? 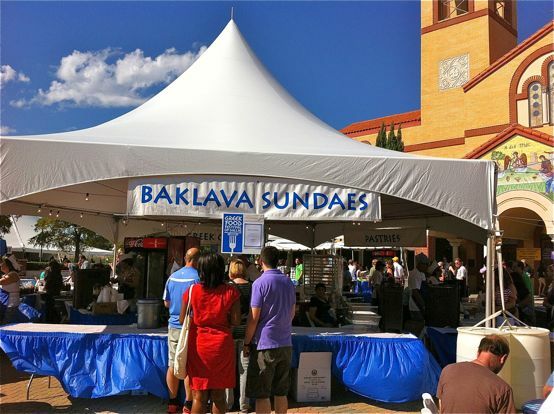 Have you ever tried Baklava or a Gyro? Fun! I’ve seen the signs for the festival the past couple of years, but I’ve never been. My co-worker went and had a blast. I’ll have to keep it in mind for next year! It was fun! Of course, I enjoy any place that has good food!